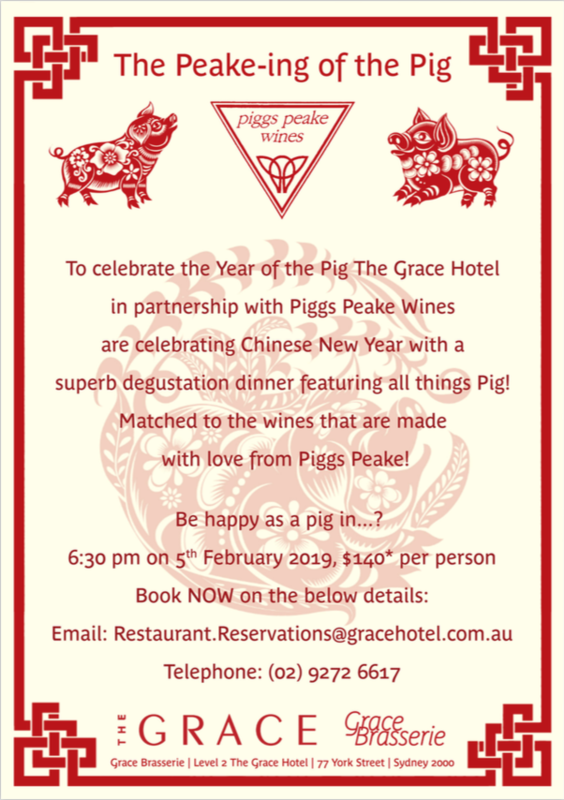 We are partnering up with The Grace Hotel to celebrate the Year of The Pig!! Degustation with all things Pig! Paired with Piggs Peake wines of course…. We will be partnering back up with Pendolino on the 23rd of October next year (2019). We will be showcasing some of our exceptional wines which will be paired with Pendolino’s world class Italian fare, located in Strand Arcade, Sydney. Join Steve at La Rosa, Strand Arcade, on the 14th of August while he talks about some of the interesting wines he produced that year. Steves style is informal and informative, the class will go for roughly 45 minutes. Light food will be supplied to compliment the wine. A perfect way to spend some time before dining at La Rosa or Pendolino. Bookings through La Rosa. Aria, La Rosa, Pendolino and Websters Bar! Yep, you read correctly! This isn’t clickbait! After swiftly selling all tickets for our event with Webster’s Bar, Newtown on the 30th of May, we added an extra night. Before we could promote the additional event, that too – sold out. If you managed to get tickets for either night, you are in for a treat. Steve is going to be pouring some of the new wines to our range. Fiano, Nebbiolo, Pignatello…. Eight wines. Three courses. Dinner done right! In the same conversation, if you didn’t manage to get seats for these events, don’t fret! We will be frequenting restaurants around Sydney (and elsewhere) showing off our range. July 25th – Steve is going to visit La Rosa, situated in the gorgeous Strand Arcade, for a more educational-focused masterclass. There he will pour a selection of wines which are new to our range, accompanied with stories and history of how the wine came about. October 24th – Back to Strand Arcade, however to a different venue. Pendolino will be hosting a 4 course meal paired with Piggs Peake wines. Pendolino dish up some world class Italian fare so this is something to keep an eye out for! September 20th – Aria, Brisbane, are welcoming us back for the third year. Details are still to come, however if history repeats itself there will be a fantastic degustation with paired wines. It is still early days for these events so bookings aren’t being taken just yet. We will let you know how to secure a seat once possible. 30th May 2018 – A night of newbies at Websters Bar Newtown!!!! Be amongst the first people on the planet to try the piggs peake newbies. Pig Juice, Pig Latin Fiano, Pig Headed Nebbiolo, Pignatello just to name a few. Plus a few old friends……………Websters has been running outstandingly good events and its always a great night with Ray and the Crew. Zin Long Lunch – 2018 Date to be confirmed. The Zin long lunch at Cargo Road vineyards, Orange. The Zin lunch has been tweaked a bit lately with James threatening to include a bracket of Riesling to freshen us up. Either way, I know how this ends. Its an event where historically too much has been barely enough. Steve is going to load up the car and do a road trip. Three states in 6 days, first stop Brisbane. Come along to Aria Brisbane for a night in the private dining room over looking the Brisbane river. We did this event last year and the food and the service were brilliant! Go Aria! 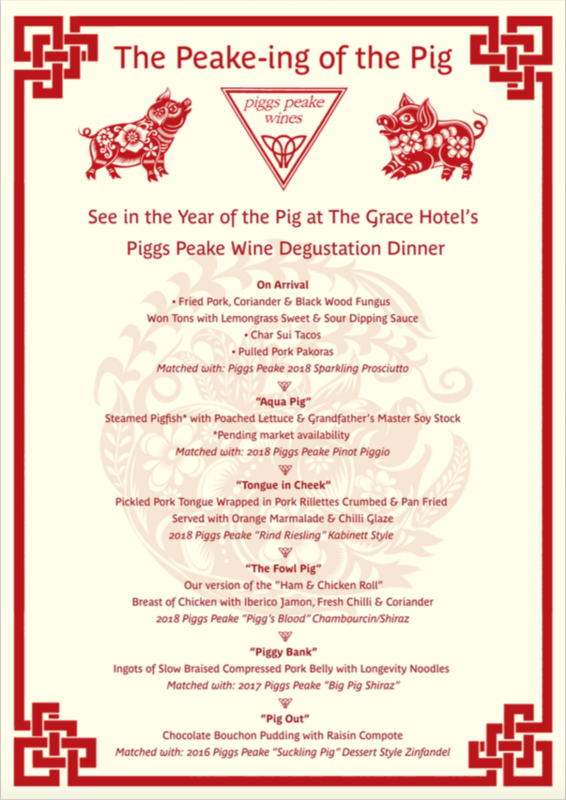 Bookings through Piggs Peake on (02) or uniquewine@piggspeake.com $140 a head all inclusive.